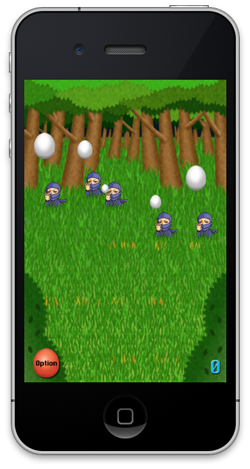 iPhone application “Egg Ninja”. - AMUZENET, Inc. Doesn't matter as long as eggs don't hit me. Slash eggs as many as possible! 1. Slash eggs that enemy ninjas throw! - Flick the screen to cut an egg. - If an egg is not close enough, you can't cut away. Slash an egg at the right moment. 2. Think about the angle of slash to get a high score! - The angle of slash changes depending on which way you flick. 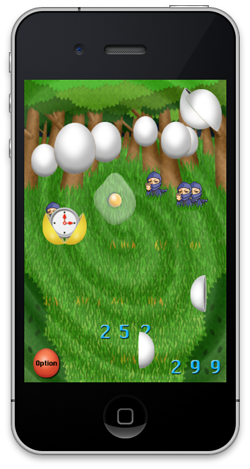 - When you continue to slash eggs at the same angle, you will get a combo bonus! 3. Slash a golden egg to get a special item! - Eggs come to you at slow speed. You can easily slice eggs. 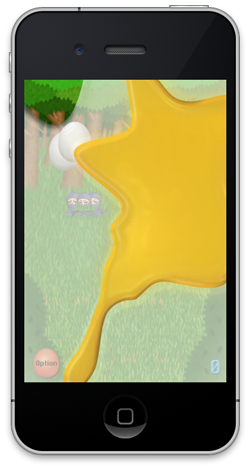 - Swipe the screen to slash eggs. You don't need to lift your finger off. When an egg hits you, the game ends. Press [scores] to check your score. The game has online ranking system. 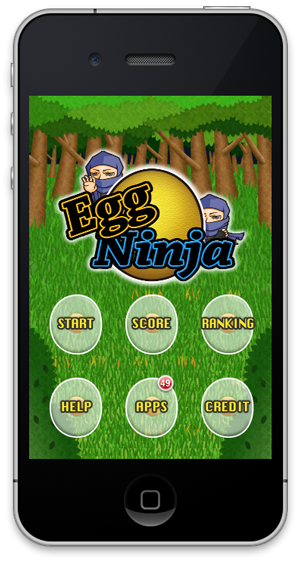 You can be a great egg slashing ninja!